I'm so excited to share the next Closet Crash Course with you! But before we get into it...can I just pause for a second, and tell you guys how lucky I am? People actually invite me into the homes, give me access to their entire wardrobe, and bring me drinks while I mess with all their stuff (it was water..but still!) Best "job" ever? 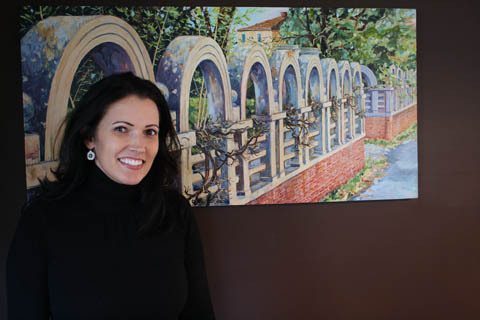 In fact, her whole house is pretty awesome (apparently "awesome" is the new "happening")...and gave me a glimpse into her style. She told me her dining room is her favorite spot in the house. I can definitely see why! I love the bold paint choice, contrasted with the clean white. And the mixture of classic patterns with more rustic pieces makes the whole look sophisticated without being stuffy. Well done, Dawn! 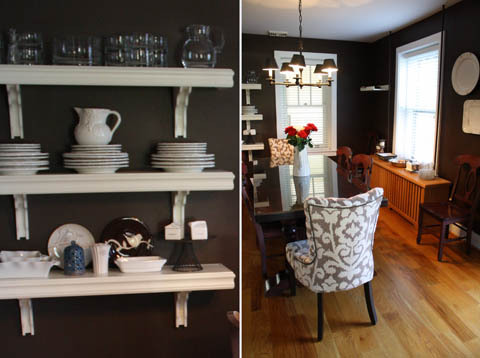 And before we move on to the real reason we're here, let me give you one more sneak peak into her adorable home. 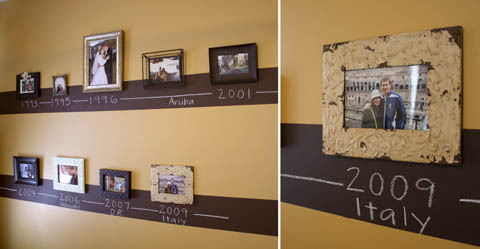 In her bedroom, Dawn made a photo wall complete with chalkboard timeline. 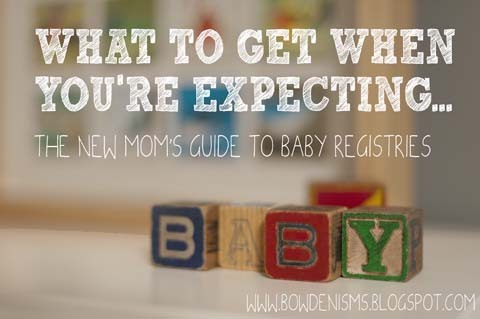 This has pinterest fame written all over it! I can definitely work with this.But wait...there's more! Yep. We're going to be just fine! So at this point, after seeing her beautiful home, and extensive wardrobe, you might be wondering what someone with such great taste, and a full closet would need with little old me? Ok...I was wondering that! When I asked Dawn what made her want to do a Closet Crash Course, she said she struggles a bit with casual dressing. She's got an awesome career in the pharmaceutical business, and can rock a biz-cas dress+blazer in her sleep. 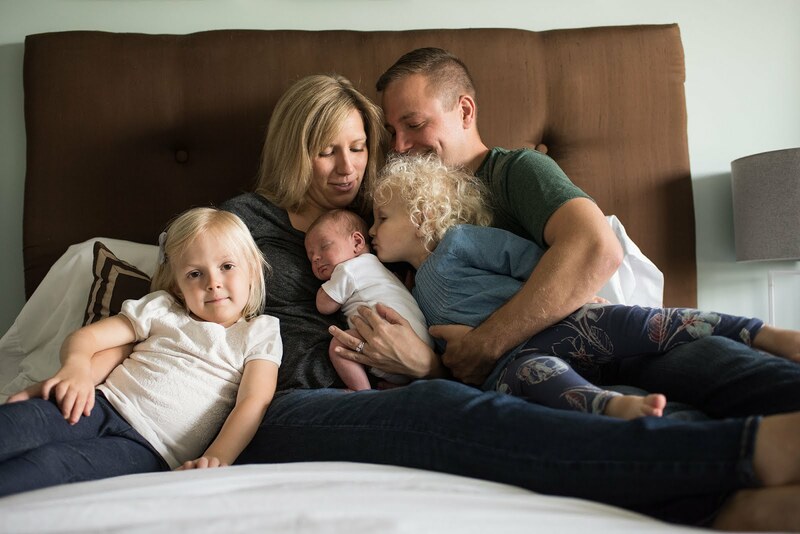 But when it comes to weekends- going out with girlfriends for drinks, taking the kids to the mall- she's not always quite sure what to do. It's a tough balance sometimes between too dressy, and too bum-y, and she needed help finding her footing there. She said she had seen my Get Dressed posts in the past, and thought I'd be able to give her some advice for the 5-9, vs the 9-5. So with that goal in mind, I started making a mess working my magic. That picture on the right? Yeah, that's a pile of just scarves. yessssssss. 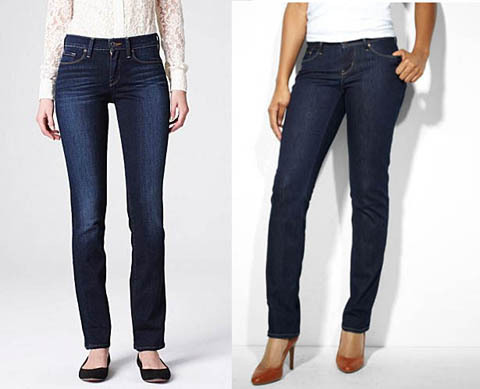 Jeans, Left: Lucky, Right: Levi's. And if she wanted to try something new, Dawn could go for a colored cord. Grey or teal are fun updates without straying too far from her comfort zone. And to complete the look, I'm recommending that Dawn ventures into Belt Territory. She confesses she likes belts...on other people...I think she really needs to give it a try though, because her tiny waist would look great with a cinched in helper. But a simple skinny braid would do just fine. 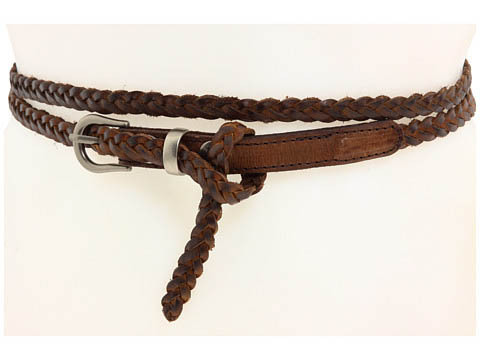 Braided belts, Left: AE, Right:Forever 21. Dawn already had all of the pieces for this outfit, but for some reason, she had the tank classified as "summer only" in her brain. 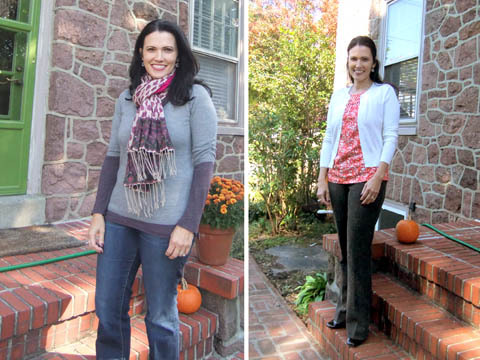 It was a simple push, but adding a cardigan helped her realize she could get more mileage out of clothes she already loved. Do you have items that you think of as "one season only"? If so- take some chances! 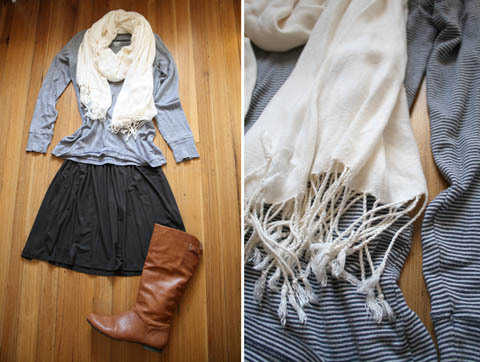 Layer a flimsy tank over a long sleeve T. Try a chunky sweater knit with a pair of shorts. You might find a new combo you love! I'm biased on this outfit, because it's my style 100%. 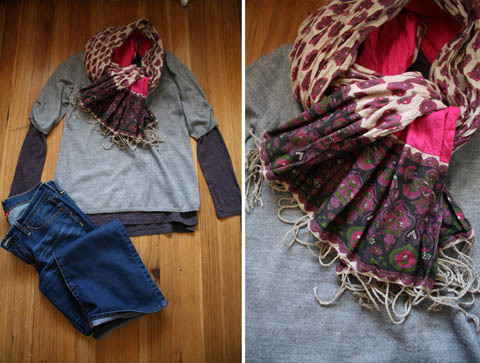 I dig the short-over-long layering, the grey and purple pallet, and obviously, that scarf is right up my alley. This was another case of a pairing that was natural to me, but maybe not so much to Dawn. And that's why I think it's so helpful to have the perspective someone that dresses differently than you...what I'm doing isn't rocket science, but it might be something that wouldn't occur to you because your style is different. And trust me- I'm sure I could learn a thing or two from Dawn when it comes to business-casual. We all have our comfort zone, and sometimes our ruts, but the goal is to encourage each other to try something new... sometimes that means a big risk, but sometimes it's just a small tweak. For this next look, I wanted to try something a bit different...Dawn loves a dress, and has a pretty solid rotation of them in her wardrobe. She also has a bunch of cardigans and jackets, so that type of combo is pretty typical for her. But I wanted to see if we could push some of her clothes out of the "dressy" category, and give her a bit more of that casual edginess she's looking for. So I started with a grey knit jersey dress, and layered a striped T over it. She's got a great cream scarf to add some contrast, make simple knit pieces look a bit more polished. For the shoes...I took one for the team...and took off my boot. A big part of the dressy/casual struggle is footwear. Dawn has a ton of healed boots, and some kick-around town type sneakers, but she's missing that in between category, that looks classy without trying too hard. (Picture: the footwear equivalent of her dining room!) I spent a ton of time searching for the perfect boot for myself, so I have to recommend it here too. I love the tall-not-too-tall height, the goes-with-black-or-brown color, and the classic-riding-boot-shape-with-a-hint-of-boho-slouch of these guys. Plus they're on sale. Score! Dawn could use one of the braided belts from the first look to finished off the look. It will help maintain her shape and prevent her from looking too layered up and frumpy. 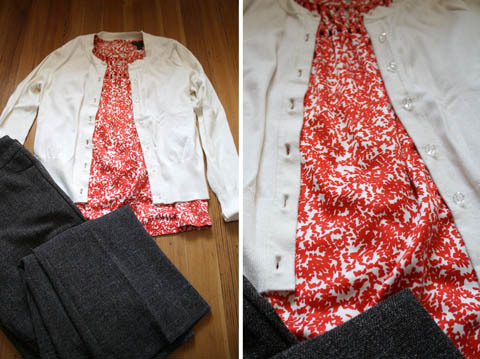 For this look I wanted to try to take one of her classic button up tops, and help bridge it more into weekend wear. I love the look of the small floral print, with the solid layer over it. 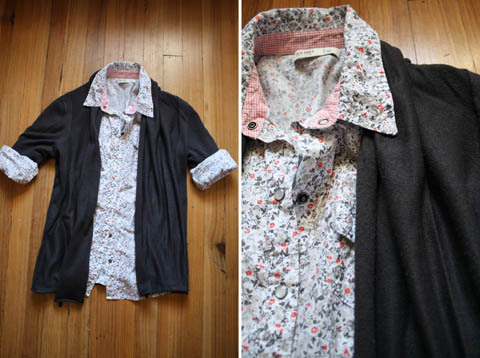 And the contrast between the structured shirt, and the drapey cardigan is an easy casual pair. Add the cords and the boots from the looks above? Perfection. Ok, this isn't technically an outfit, but stay with me for a minute. 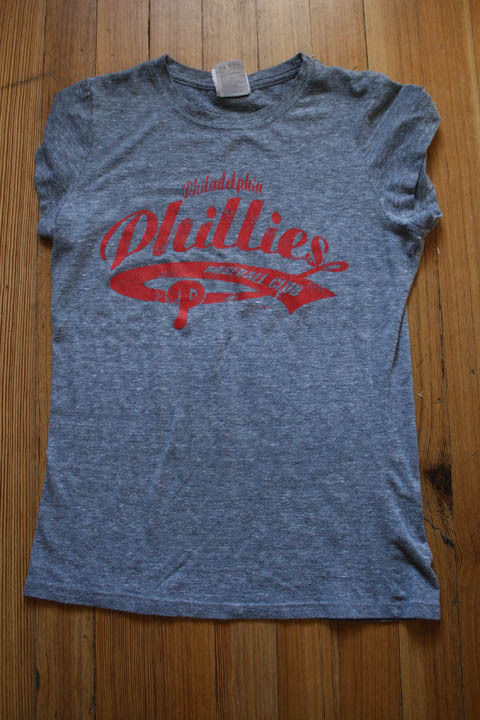 I found this Phillies T in her dresser, and had a hunch that she loved it, but didn't think it was really appropriate for doing anything except watching the game in her sweats. (annnnnnnnd, I was pretty much right). But fitted graphic T's like this can be perfect for hanging out on the weekends...in public even!...if you pair them with the right thing. Here I'm suggesting Dawn look for a casual military inspired jacket. Layering that over a plain T give it a bit more style, and saves you from wearing a ratty hoodie just because your arms are cold. I like that this one has the waist detail, so Dawn can cinch it in. That will help keep the look feminine, and save her from feeling overwhelmed by a larger silhouette. 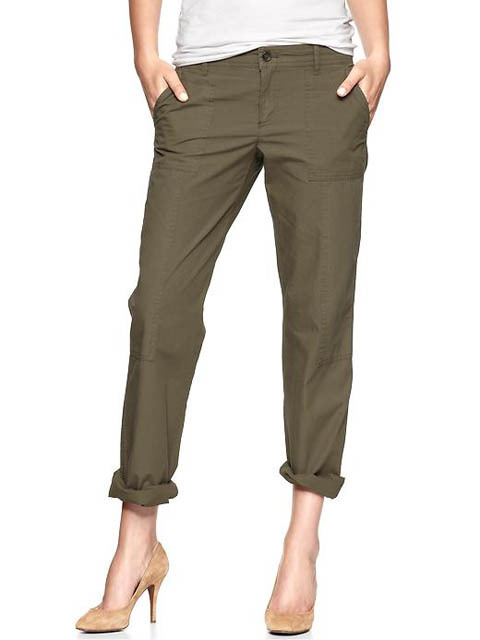 And I'm a little reluctant to suggest it, because the price is a little high for my taste, but this version from Lucky Brand is pretty perfect. I like the shorter length, and more tailored shape. I think this could pair well with just about anything Dawn owns, and plays to her comfort level with jackets- just taking it into a new realm. 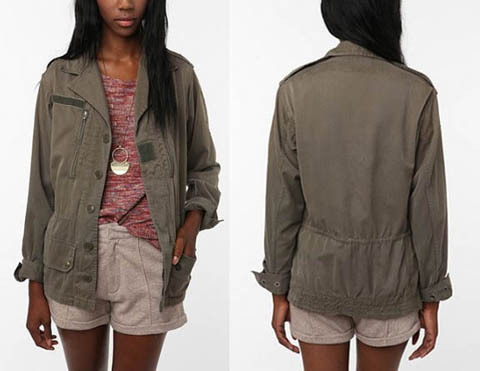 Army Green Jacket: Lucky Brand. And last but not least, we have a Closet Crash Course tradition: a piece I wish was mine! A grey cowl sweater with a kangaroo pocket? Yes please. Everyday. I think this item is perfect for Dawn, because it's the ideal mix between classy and casual. 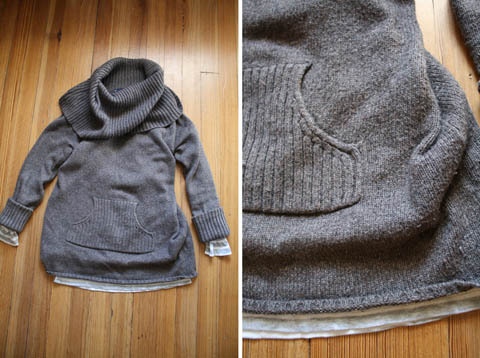 It takes cues from typical sweats, but ups the style quotient a bit with rich sweater yarn, and great ribbed details. This is the type of thing she should look for more of: pieces that borrow some elements of what she already knows works for her, and add in a bit of the laid-back fashion that she's looking for. 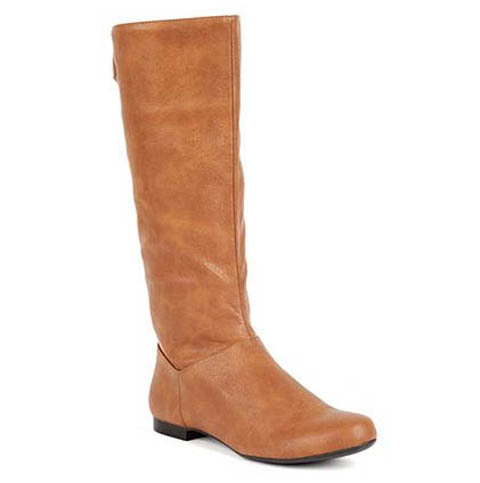 These pair easily with jeans, but would also look great with a casual pant (heel and tightroll hem optional). So there you have it, another Closet Crash Course on the books. I had so much fun with Dawn...she was so excited about the process, and even did a mini-photoshoot with her daughter after I left. Is she the best? Looking great, Dawn! Hope you all loved this round as much as I did! 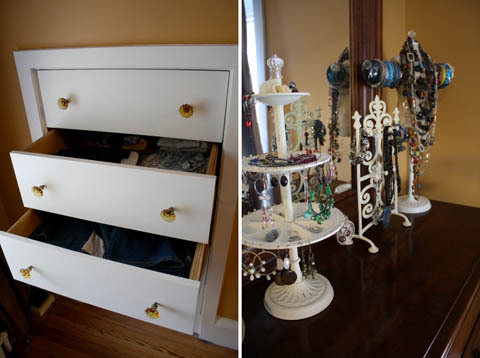 Interested in a closet crash course of your own? Email me for details! P.S. The Loft has teal skinny cords. I *almost* got a pair when I got my black ones (at their 50% off sale) but they didn't have my size! Boo! I think about them daily and what could have been. Oh, and I had an outfit specific question for you. I have a specific shirt and pants in mind to wear, the denim western style shirt from AE (on sale now, I think!) and I wanted to know if I could pair it with the black skinny cords. 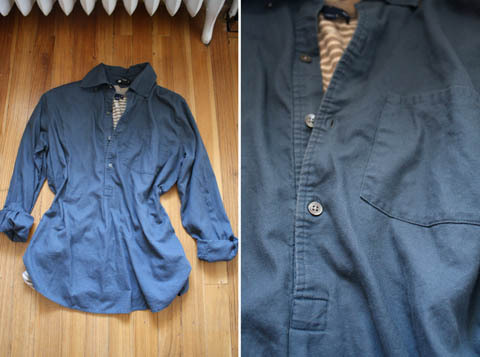 I just never know what to wear with the light wash denim shirt so I never buy it. 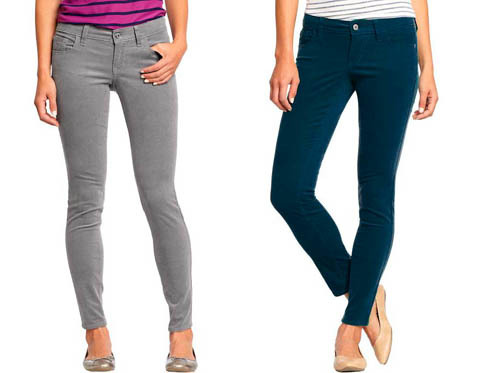 I have darker rinse jeggings from AE too, but I don't know that they are dark enough. never heard of Canadian Tuxedo - haha - had to click on the link! love all the suggestions!!! it will be nice to go out shopping with some specific things in mind that will help me with this area of my wardrobe. thanks again for taking time out of your weekend visiting family to do this for me! @Hilary...so jealous! Yes, my total with shipping came closer to $53.00. However, I suppose it was worth it (to me) not to have to drag my kiddos to Macy's in the hopes they had my size. I don't have a Macy's super close, but $37 is awesome! ah yes, the canadian tuxedo. only made worse with bling. I *almost* made that mistake once.